See what all the talk is about tonight. Taking back what is theirs. Meet Cloak, played by @AubreyOMari. Meet Dagger, played by @Olivia_Holt. Father Delgado (played by Jaime Zevallos) is constantly seeking redemption in spite of the fact that he’s not sure that he deserves it. As a school counselor and priest, Delgado is a rock to Ty. Oppressed by the collar, he leads more through words than example, as he still struggles daily with the life he has chosen. Detective Brigid O’Reilly (played by Emma Lahana) is accustomed to working in a man’s world but she isn’t looking to be “one of the guys”. Her New York sensibilities have hardened her from being too friendly or open, setting her apart from her Louisiana counterparts. Brigid believes in justice and doesn’t think that anyone should be above it, including other cops. Especially other cops. “Marvel’s Cloak & Dagger” is the story of Tandy Bowen (Olivia Holt) and Tyrone Johnson (Aubrey Joseph) – two teenagers from very different backgrounds, who find themselves burdened and awakened to newly acquired superpowers which are mysteriously linked to one another. Tandy can emit light daggers and Tyrone has the ability to engulf others in darkness. They quickly learn they are better together than apart, but their feelings for each other make their already complicated world even more challenging. 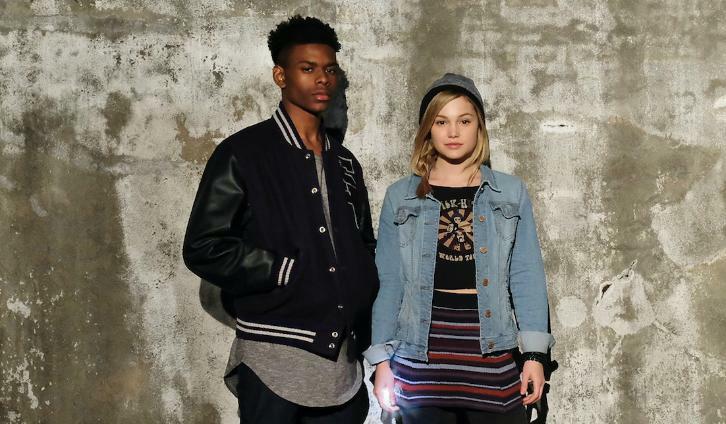 “Marvel’s Cloak & Dagger” stars Olivia Holt, Aubrey Joseph, Andrea Roth, Gloria Reuben, Miles Mussenden, Carl Lundstedt, Emma Lahana, Jaime Zevallos, and J.D. Evermore. The series will premiere on Thursday, June 7 (8:00 – 10:00 p.m. EDT/PDT) and is co-produced by Marvel Television and ABC Signature Studios. Joe Pokaski (“Underground,” “Heroes”) serves as showrunner and executive producer; Jeph Loeb (“Marvel’s The Punisher,” “Marvel’s The Defenders”), Marvel’s head of Television, and Jim Chory (“Marvel’s The Punisher,” “Marvel’s The Defenders”) also serve as executive producers. Gina Prince-Bythewood (“Love & Basketball”) directed the first episode. “Marvel’s Cloak & Dagger” is the story of Tandy Bowen (Olivia Holt) and Tyrone Johnson (Aubrey Joseph) – two teenagers from very different backgrounds, who find themselves burdened and awakened to newly acquired superpowers which are mysteriously linked to one another. Tandy can emit light daggers and Tyrone has the ability to engulf others in darkness. They quickly learn they are better together than apart, but their feelings for each other make their already complicated world even more challenging. The network has ordered 10 one-hour episodes slated to debut early 2018. “Marvel’s Cloak & Dagger” stars Olivia Holt, Aubrey Joseph, Andrea Roth, Gloria Reuben, Miles Mussenden, Carl Lundstedt, James Saito and J.D. Evermore. The series is co-produced by Marvel Television and ABC Signature Studios. Joe Pokaski (“Underground,” “Heroes”) serves as showrunner and executive producer; Jeph Loeb (“Marvel’s The Punisher,” “Marvel’s The Defenders”), Marvel’s head of Television, and Jim Chory (“Marvel’s The Punisher,” “Marvel’s The Defenders”) also serve as executive producers. Gina Prince-Bythewood (“Love & Basketball”) directed the first episode.